The idea behind this framework is to simply have a main context and some services. Context: is a place to register and get services. Service: anything in the game/app that offers a service. like uiService, audioService, gameService, backendService etc. Make your own context derived from GameContext. Implement your services derived from IService interface or use predefined helper services. 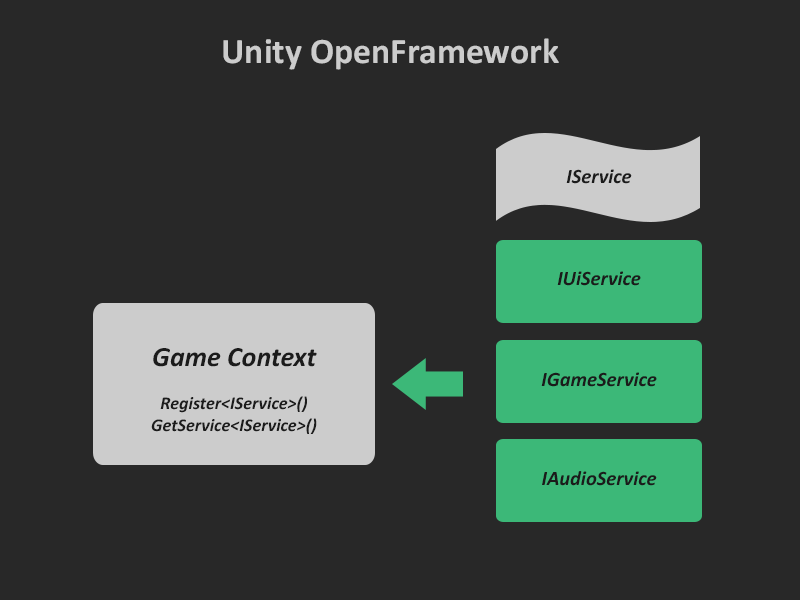 In your gamecontext, register your services inside SetupGameContext method. call Init(this); after registering all services. this will initialize all services one by one and pass your context as gamecontext of the services. So this is the basics you need to do and you are good to go! // if you need, subscribe to OnReady in your services. // after all services registered and initialized successfully, OnReadyCallback will execute. // do your stuffs here or subscribe to OnReady in your services. Interface simply inherits IService. you can add any method/property as you like. Each IService has context so you can have access to other services and ready to check if your service is ready to use yet. // do anythign sync/async here and when your service is ready set that to true. You can start and stop your services as you like. set initial valuse or dispose them on StopService. or don’t use them! Each service that inherit from IUpdatable will have IUpdate method so we can have update cycle in our services. Task was to add two numbers in update. How far you can go with this? Write custom service and send a pull request. You can port any asset/lib as a service and share them as gist. ie. port LeanTouch into InputService! or Tween libs into TweenService. after ~year we will have a framework that we only write game logic instead of doing same things for every project!